It's a good question, because the SV4 has a series of good baffles and is coated on the inside with a textured flat black paint. I've never really worried about missing contrast. When the scope was new, it looked like the photo on the right. There was a little dust from the factory and nothing else bothered the view. The baffles in the tube are readily visible as is the mostly non-reflective paint on the inside of the surfaces. As my skills with calibrating and squeezing more performance out of my camera has improved, I've been showing deeper details that were previously unseen by my efforts. At the same time, I've been showing some flaws in the way things work. There are slight gaps in the drawtube of the focuser and the paint is not fully non-reflective. This latter point is even visible in the as-new photo showing the slight pale ring reflection on the inside of the dew shield. I felt that maybe the time had come to address some of these issues, especially since I'd learned how to take apart the SV4 and was no longer worried about the delicate nature of the method. It's actually not so delicate and components are rather sturdy. While the moon is currently full, I have been looking into doing a little bit of maintenance with my scope. I had done some imaging of IC 1396 recently and noticed that Erakis was causing some flare in the image. In the Leo image, the flare appears to be entering directly from the middle bottom of the frame. It's caused by 73n Leonis, a 5th magnitude star. In the processing, I tried to reduce the effect of the flare which is why it's not so notable in the final version. Each of these show a specific texture to the flare. There's a straight line look, almost iridescent ray that comes in from off the side of the frame. To my eye, it looks very much like the reflection from anodized metal. This made me think a lot about a recent article from SBIG that discusses some problems with flats and how IR can make things challenging. This will be the topic of another post showing how I worked on flats. Because of the work I'd done recently to identify light leaks from around the feathertouch focuser, I was aware of the way that the anodized fins and flat surfaces on the drawtube were locations where off-axis light could bounce around. The above is looking through the focuser from where the camera would be. Note the bright spots on the baffles and rings inside the drawtube assembly. 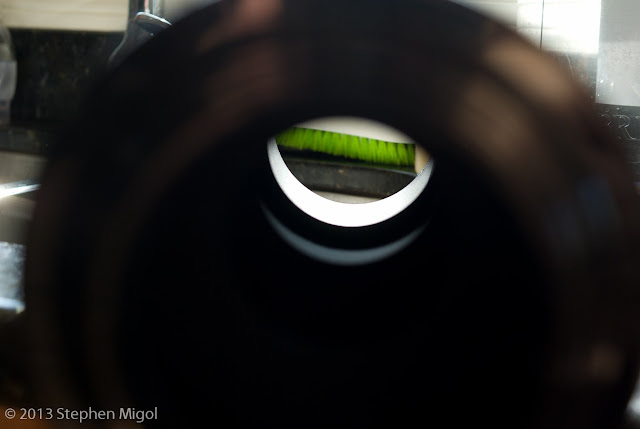 The above image is of the focuser viewed from inside the scope. Note the gaps where the rollers for the drawtube run. This is an area for light ingress as well as the sleeve of the drawtube as the yellow background shows through. Looking through the scope tube. 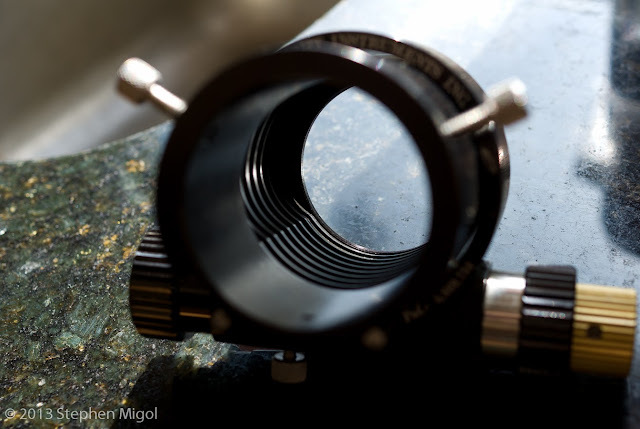 Looking down the scope body. 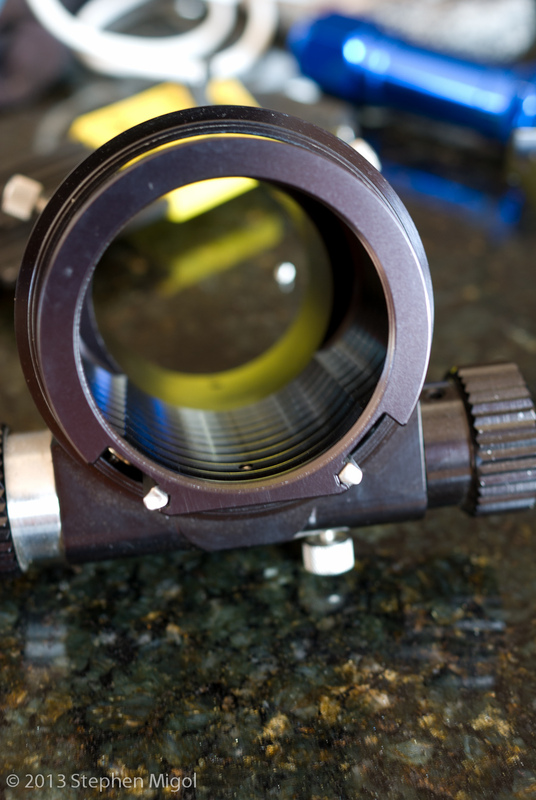 There are some baffles in place already, the bright area is just inside where the lens cell would be. This area is currently painted with flat black paint but still offers a lot of places for reflection. There's nothing shiny, so any reflections are just a dull glow that may rob overall contrast. As can be seen here, the inside of the lens cell has an area between the pipe threads and the glass that has an orange-peel finish black paint. I've decided to cut the flocking paper a little long for the tube so that it overlaps this area. I did try putting a strip of flocking paper in this area and it was too difficult to manage so close to the optics. In the end, the paper inside the tube works well enough. 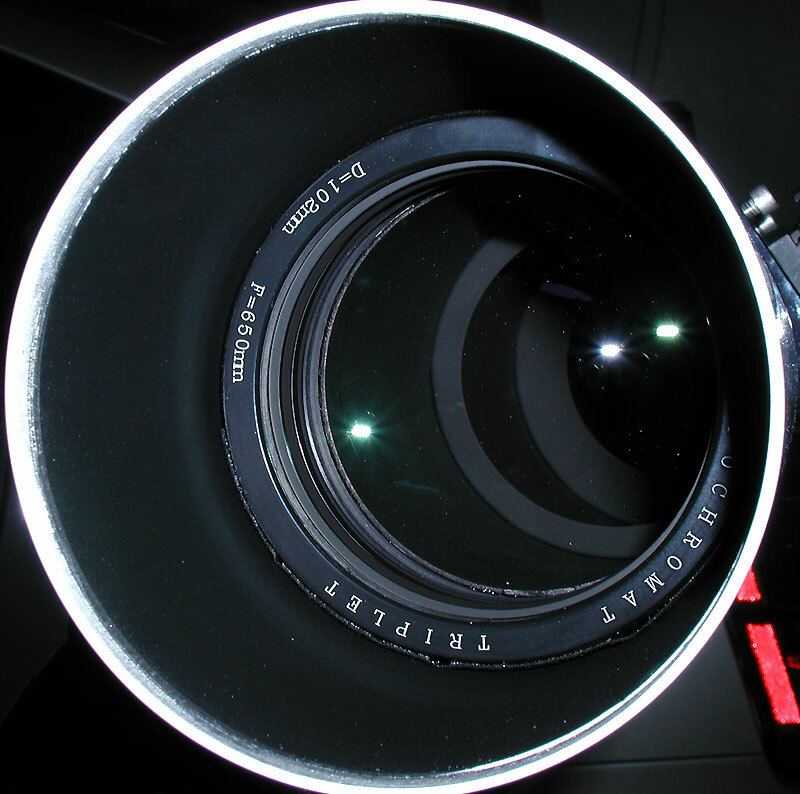 Front of the SV4 Lens Cell. It's kinda dirty from the last time I cleaned it back in January. Nothing that some methanol and a microfiber cloth can't handle. I used the puffer bulb to get rid of the worst, then soaked a microfiber cloth with some methanol and gently wiped the surface. Everything came off clean, leaving a nearly-blemish free surface. 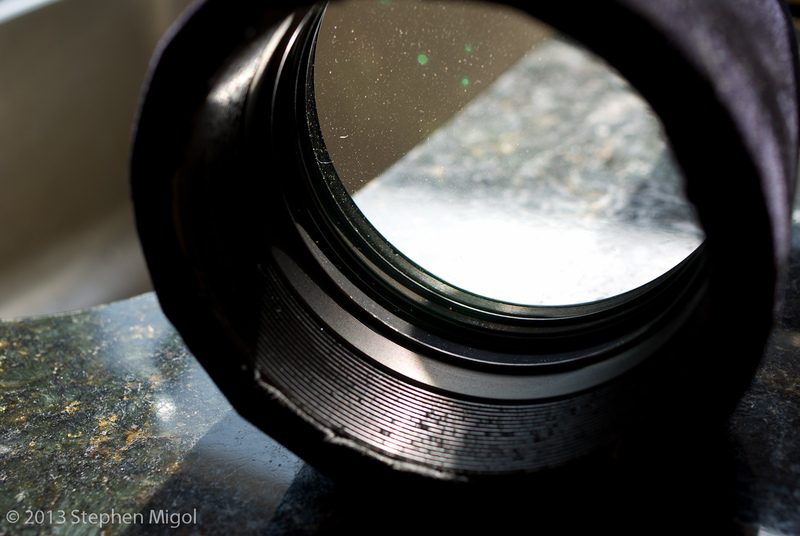 I normally wouldn't do anything about the dust and only did the cleaning because I had the lens out of the scope. It may be a few years before I clean it again. Incidentally, this lens cell is heavy -- easily half the weight of the scope. I think the metal is probably steel to keep the size from changing much with temperature. The thickness of the glass is a bit hard to measure, I'd guess at least 1.5 inches. That much material makes for a hefty puck. I also flocked the inside of the dew shield. I didn't take any pictures of that exercise because it's just a dew shield and there's nothing really special about it. The flocking material I used was from Scopestuff. http://www.scopestuff.com/ss_flok.htm I got a couple of sheets of the paper so that I could put it on a variety of surfaces. 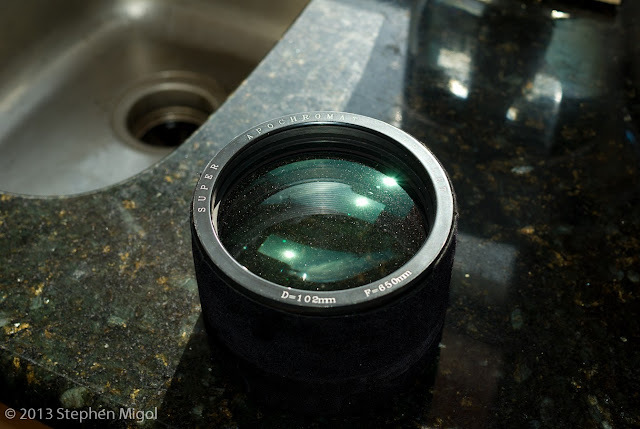 I'd already used it inside the flattener and even in the T-ring. I've made it part of the tube I use when photographing negatives, too. Good material, really sticks strongly. Not very stiff when the backing paper is removed, so it can be a dexterity challenge when using a small amount in a tight space (like a flattener). I'll probably flock the inside of the SV 70 ED eventually as it will someday be pressed into service as a wide-field imaging scope. I'll follow up in a later post with pictures of the assembled system.